The recipe following this introductory paragraph first appeared in A Baker’s Field Guide to Christmas Cookies. These are a classic buttery, almond crescent-shape cookie, most often found around the Christmas holidays. What makes this one a little different is the generous use of vanilla bean and also the combination of confectioner’s sugar and granulated sugar for the topping. Description: These delicate, crumbly crescent shaped cookies are redolent with vanilla, both from vanilla bean in the batter and in the sugary topping. Make sure to have a vanilla bean on hand so that you can make these as suggested; substituting vanilla extract in this recipe just won’t give you the same results. Historic Notes: This is a very old recipe, yet still as popular as ever, particularly in Vienna. 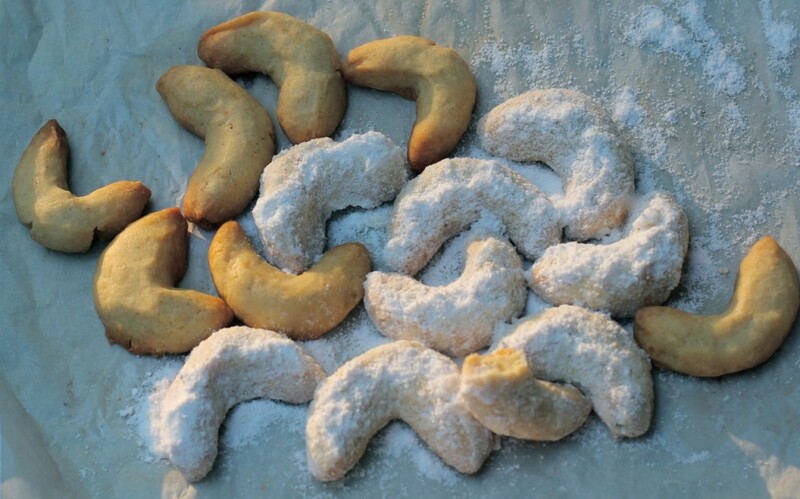 Indeed you will occasionally see these called “Viennese” crescents. Vanilla sugar is a classic ingredient in that part of the world and bakers and even home cooks can find it in grocery stores – lucky for us the technique below makes it easy to prepare these cookies. For the Cookie: Place flour, almonds and salt in bowl of food processor fitted with metal blade and pulse on and off to coarsely chop the nuts, then turn machine on and process until nuts are finely ground; set aside. Place butter in bowl of mixer and beat with flat paddle on medium-high speed until creamy, about 2 minutes. Split the vanilla bean lengthwise with a sharp knife, then scrape vanilla bean seeds into the butter using a butter knife or spoon. Beat butter for 1 minute to blend in the vanilla beans. Add sugar and continue beating until light and fluffy, about 3 minutes, scraping down the bowl once or twice. Beat in egg yolk. Turn machine off, add about one-third of the flour mixture, then turn machine onto low-speed. Gradually add remaining flour, mixing just until blended, scraping down bowl once or twice. Scrape dough onto large piece of plastic wrap. Use wrap to help shape a large, flat disc then cover with plastic wrap. Refrigerate at least 1 hour or until firm enough to roll. Dough may be refrigerated overnight in which case you may need it to soften a bit at room temperature before shaping. (You may freeze dough up to 1-month double wrapped in plastic wrap; defrost in refrigerator overnight before proceeding). For the Topping: simply wipe out the food processor bowl to clean it of any flour. Place sugar and powdered sugar in bowl of food processor fitted with metal blade. Split the vanilla bean lengthwise with a sharp knife, then scrape vanilla beans into the sugar mixture using a butter knife or spoon. Pulse on and off several times to disperse vanilla bean seeds. Pour vanilla sugar into a small bowl; set aside. Position racks in lower third and upper third of oven. Preheat oven to 350 degrees F. Line two half-sheet pans with parchment paper. Roll dough between your palms or on work surface into 1/2-inch wide by 2 1/2-inch long logs with slightly tapered ends. Place on prepared cookie sheets about 2-inches apart and bend into a crescent shape. Repeat with remaining dough. Bake for about 15 minutes or until light golden brown around the edges and on the bottoms. Slide parchment onto racks to cool cookies for a minute or two. While still warm, roll each cookie in the vanilla sugar mixture and replace on parchment on rack to cool completely. (Cookies may be stored at room temperature in an airtight container for up to 2 weeks).